An oscilloscope (often abbreviated o'scope or scope) displays signal voltages as a 2-D graph, usually as voltage (vertical axis) as a function of time (horizontal axis). The o'scope is one of the most important pieces of test equipment because it lets you look at what is happening in different parts of a circuit. Without it you are almost blind ( multimeters and logic analyzers can also help you "see" ). The probe of a o'scope is held against, or is clipped to, the metal wire carrying the signal of interest. A dual-trace o'scope has 2 probes, so 2 different signals can be seen -- so not only the shape of the signal can be seen, but also the exact time from events on one signal to events on the other signal. Sometimes one wants to look at a 8-bit data bus -- typically one uses a "logic analyzer" to look at lots of time-aligned digital signals. For a given number of signals to look at, oscilloscopes (which show the true analog waveform) are much more expensive than logic analyzers (which only show if a digital waveform is hi or low, above or below the logic threshold). Many people buy both a (dual-trace) o'scope and a 16-trace logic analyzer, which together have a total cost less than one true 8-trace o'scope. Here is a useful discussion comparing low-cost USB oscilloscopes with older analog scopes available for comparable prices; it is a 9-minute video, with a useful forum-type discussion (some mildly rude language is used to describe USB scopes). The conclusion is that the low-cost USB DSOs have attenuators and triggering circuits which do not perform well at higher frequencies, and are not recommended. Quality DSOs do not suffer from these problems, but all except the very best and most expensive have storage limitations which cause problems in the particular case of observing a high frequency signal at a time/div setting much longer than its period, e.g., two complete TV fields at a setting of 40msec/div. Of course, you have to already have a working o'scope in order to build and test another o'scope, making this the same sort of chicken-and-egg problem as the RepRap project, the GCC project, and other projects David Cary finds interesting. This problem in respect to oscilloscopes can be solved by incremental development. First start of working your way towards acquiring analog data using an ADC connected to some sort of processor or controller. Then build a cheap device that provides a somewhat defined test signal (simple timer works just fine). Now you can go to the next step of learning about and building an analog front-end that will be connected to the ADC. Then you'd start thinking about how data flows through the system, beyond the ADC and the processor (definitely to to memory and later on the display, maybe to non volatile storage like USB mass storage). That's basically it. Okay, you need to build and hookup a display and a keyboard but what you have is (at least in theory) the central parts of an oscilloscope. All 100MHz, 40MS/sec, 2 analog and several logic channels (3.3/5V CMOS/TTL). Buffer sizes range from 12kB to 1MB. Some people on the PIClist have been discussing designing an open-source oscilloscope. I think initial discussions occured on the "scope project anyone?" thread  at PIClist. $249 The Xmegalab is a development board for AVR XMEGA microcontrollers, a dual channel oscilloscope, an arbitrary waveform generator and a scientific calculator. Xmegalab. Alpha version of the firmware (mostly in C) has been released under the GPL. Serial port; SD Card with FAT File System support, etc. $35 The Xprotolab is a small mixed signal oscilloscope in a DIP module, designed to be used on a breadboard. It also has an arbitrary waveform generator. Xprotolab. Discussion at RepRap: "Xprotolab - Miniature Oscilloscope and Waveform Generator". Miniscope v2b is a simple AT91SAM7S64 based signal acquisition device with low sampling speed (single channel, 500 kSps internal ADC) but large sample buffer sizes (up to 512 kSamples) and continuous signal recording capability. Miniscope v2c (2 channels, sampling 2x461 kSps) is using smaller (LQFP48) and cheaper STM32F103C8T6 microcontroller and DIY-friendly single sided PCB. For low frequencies, pretty much any external sound card with a line input will work. External card line inputs generally have a range around 0-1 V whereas onboard microphone inputs only have up to about 50 mV, which just isn't enough sensitivity. The Virginia Tech Lab-in-a-Box recommends the Behringer UCA202. To use a sound card oscilloscope on a regular basis, a circuit with variable attenuation is recommended (i.e. 1x and 10x). 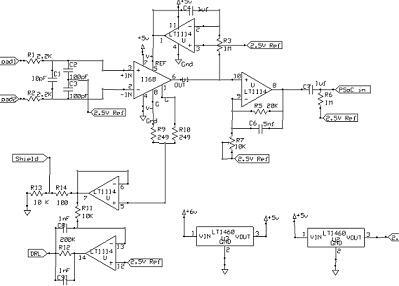 Compensation for the hardware and software gain can be done as part of the attenuator circuit or in software. For mixed-signal development, where debugging requires you to see both analog and digital signals at the same time, oscilloscopes intgrated with logic analyzers are needed. More advanced features here include protocol decoding, which allows you to easily see the values sent over digital interfaces. The Parallax PropScope PropScope ($200) offers 25Msps sample rate and 4 bits of logic analyzer and 4Kbytes of buffer. The QuantAsylum QA100 ($349) offers dual 100Msps sample rate and up to 32 logic channels with 2Mbytes of buffer. The PicoScope 100 ($575) offers a single channel at 40 Msps, 8 logic analyzer channels and 16Kbytes of buffer depth. xoscope an open source software for soundcard oscilloscope goto http://sourceforge.net/projects/xoscope/. []A New oscilloscope concept go http://www.sciencetronics.com/greenphotons/?p=459. SourceForge welecw2000a Open Source firmware for the 1 GS/s Welec W2000 Series DSO hardware (which costs €800-1500 in spring 2012) under GPL. Sourceforge: xoscope is a digital oscilloscope for Linux that uses input from a sound card or EsounD and/or a ProbeScope/osziFOX and will soon support Bitscope hardware. The sound card device is hard-coded but instructions for modifying it are on the VTLUUG wiki. Baudline GPL version is a signal analyzer designed for scientific visualization, using input from recorded data files or from a sound card. For Linux / Solaris. The source code is expensive and it is intended for corporate buyers. Miniscope v3 and Miniscope v4 are digital oscilloscope software for Windows. They connect to device using external dll. Libraries are available to connect with sound card, Microchip MCHPUSB Generic HID Demo and custom AT91SAM7S64 hardware. V4 supports an unlimited number of channels, but is more complex than single-channel V3. Digital Soda is a simple GTK+ frontend for the DSO-2250 USB oscilloscope for Unix/Linux. Osqoop is an open source software oscilloscope. Osqoop project features an arbitrary number of channels and long acquisition durations. Signal processing and external peripherals control is possible through a plugin architecture. oscilloscope pic microcontroller demo oscilloscope PC based oscilloscope embedded system parallel port LPT. ArduinoScope Oscilloscope based on Arduino hardware platform and Processing library. There is an article about it in French. Is there any difference between Arduinoscope on github vs Arduinoscope on Google Code? Instructables: "Girino - Fast Arduino Oscilloscope by Caffeinomane" has another ArduinoScope tutorial. DIY USB connected Oscilloscope based on dsPIC30F4011 with simple hardware. Windows GUI software and PIC Hex file provided along with construction details. "Multi-Instrument" converts a PC into multiple test & measurement instruments such as oscilloscope, spectrum analyzer, signal generator, spectrogram, distortion analyzer, network analyzer, data logger, LCR meter, vibrometer, etc. Besides sound cards, it can use many models of ADC/DAC cards. Versions at US$50, 100, 200; free trial with full functionality for 21 days. Baudline gratis download (dual-licensed, see Free Software entry). Zelscope Converts your PC into a dual-trace storage oscilloscope and spectrum analyzer. It uses your computer's sound card as analog-to-digital converter. Windows trialware. BitScope DSO is a digital oscilloscope logic analyzer for Linux and Windows. Software itself is free, but works with BitScope hardware, at AU$300-1500. Zeitnitz Souncard Scope and function generator. For Windows but runs under Wine. Free of charge (but explicitly described as not freeware) for private and educational use, otherwise available for purchase. Oscilloscope analysis software from Tektronix for their oscilloscopes. E.g. technology-specific measurement and compliance software, application solutions for jitter and timing analysis, and channel emulation and equalization tools. "TinyScope": "A simple all-valve 1-inch oscilloscope by Ian Wilson K3IMW and Hans Summers G0UPL". Includes detailed circuit diagrams and construction notes and tips for reducing interference. "Mini-Scope": "An even simpler all-valve 1-inch oscilloscope by Len Hall G3IGI (SK)". Includes circuit diagrams, etc. "Toy Oscilloscope". Includes circuit diagrams, theory of operation, etc. "Handheld Multifunction Scope" by Jingxi Zhang & Yang Zhang, 2007. "dual-channel oscilloscope supports 250 ksps for each channel". ... also: ohmmeter, capacitance meter, and inductance meter ... pulse generator ... small speaker and OLED output. All functions work stand-alone with OLED display, but it can also be to a host PC with the USB port to display waveforms on the PC display. Dan's Workshop: Notes on converting that old compact tv set or computer monitor into an oscilloscope. "TV Oscilloscope Adaptor" "This ... adapter ... changes a TV to a Oscilloscope." "DIY HACK - Make your own Oscilloscope"
"The µSCOPE: A poorman's oscilloscope" by Ronald Dekker. An extremely small and low-cost circuit based on the 8 pin Microchip PIC12f675; displays "signals up to a few kHz" on a PAL TV screen. "isochronous code". "A Preamplifier for Smartphone Oscilloscopes" by chipstein. Epanorama has many links related to o'scopes and o'scope accessories . some low-cost oscilloscopes, in no particular order. ... it would be nice to mention sampling rate, # of analog input channels, # of digital input channels, whether it can be used under Linux, does it have output channels ... price should (?) include 2 analog probes, ... is it open hardware? ... anything else? under $600 : Jameco has some actual stand-alone oscilloscopes for under $600. So does www.tequipment.com - see Rigol 'scopes from China - good quality - also on eBay. under $200 : Carl's Electronics has some stand-alone and PC-hosted (parallel port?) oscilloscopes for under $200. $500 DS1022C : 2 Channel, 25 MHz Rigol Technologies Inc.
$950 DSO-8502 USB Oscilloscope, 2 analog inputs (250MSa/s) + external trigger; 1 digital output (trigger out); buffer: 512K points/ch. $799 DSO-8202 USB Oscilloscope, 2 analog inputs (200MSa/s) + external trigger; 1 digital output (trigger out); buffer: 128K points/ch. US$50-450 approx. second-hand, TWD120, Tektronix digitiser from 1995, with software is full-functioned 2-channel 100MHz, 100Ms/s, 5,000 data point digital storage oscilloscope with similar capabilities to TDS320. Uses SCSI interface to PC running, officially, Microsoft Windows 3.1; PC needs PCMCIA, Expresscard, PCI, or other SCSI interface (some USB SCSI interfaces only work with storage devices). Known to run under all 32-bit Windows versions up to 7. Can have issues with SCSI cards, resolvable with some Web searching and knowledge, and Regis Crellier's shim .DLL. Dedicated Tektronix software only, no official information available on command protocol to adapt other software. FIXME: Measurement Computing has some wireless and USB analog DAQ instruments -- add to the above list. FIXME: DATAQ Instruments, Inc. has some USB and Ethernet analog DAQ instruments -- add to the above list. FIXME: DesignNotes.com, Inc. has some USB and handheld LCD o'scopes from Velleman: Velleman oscilloscopes -- add to the above list. FIXME: Link Instruments Inc. has several USB o'scopes and "USB MSO" ("mixed signal o'scope"). Are they already listed above? EasySync is a distributor of RockyLogic's ANT8/etc products. Test Equipment Solutions Today, Inc. is a distributor of Rigol's DVM and oscilloscope products. When you search eBay for oscilloscope, you might find some good deals. Keith has made a list of "PC USB logic analyzers that cost under $1000. ", some of which can be used as an o'scope. Should I use the same $1000 price cut-off for the above list? Or perhaps double or halve it? The David at "davr.org" has made a list of "PC-based Logic Analyzers under $500"
"low cost or DIY buildable logic analyzer" discussion at chiphacker. Brooke Clarke has posted a list of "PC based Oscilloscopes"
Other discussions of "Cheap digital storage oscilloscope"
Massmind: Tools lists a few sources for a variety of tools used in electronics: o'scopes, logic analyzers, meters, waveform generators, etc. Slashdot: "Cheap PC Oscilloscopes - Any Recommendations?" Slashdot: "Building a Cheap Oscilloscope Using Your PC?" "Digital oscilloscopes for hobbyists comparison"
General Radio Scopes A bit of history. Nick Marchuk and David Meyer designed the nScope. Is the "nScope" available for purchase (perhaps as a kit) or open-source hardware or both? (via http://hackaday.com/2013/11/22/building-a-crystal-clear-whiteboard/ , where several commenters mention the nScope). This page was last modified on 9 January 2016, at 20:15. This page has been accessed 344,000 times.